ESTEVAN, Sask. - Curling Canada is experimenting with new timing rules this week at the Canada Cup in Estevan, Sask. with hopes of creating a quicker, more aggressive version of the Roaring Game. It’s fair to say the new rules are receiving mixed reviews so far in its early stages. “I absolutely hate it. I really do,” two-time Brier champion Brad Gushue said Friday following his win in the round robin finale. Instead of having 38 minutes of thinking time for an entire 10-end game, teams now have four minutes per end for the first half of the game and four minutes and 15 seconds per end for the second half. Teams are also given two 90-second timeouts per game and a 30-second timeout for a skip’s last throw in each half. Technically speaking, teams have more time in total, but the time allotment per end forces an even pace throughout rather than banking time for later in the game. This is exactly the thinking behind giving the new timing rules a try at the Canada Cup. 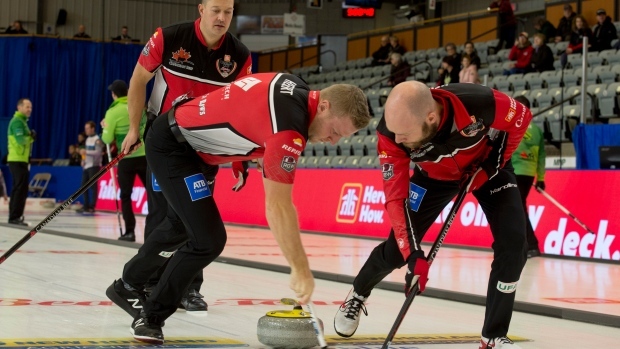 Danny Lamoureux, Curling Canada’s director of championship services and curling club development, says removing the ability to save time by blanking numerous ends consecutively will hopefully lead to a more aggressive and intriguing style of play. Lamoureux reiterates it’s not their mission to remove the blank end entirely as it has always been a part of curling strategy, but knows it’s something they hear from fans on a regular basis. However, Gushue says the quicker timing method takes away what’s unique about curling from a fan’s perspective watching on TV. The timer starts once an opponent’s rock has come to a rest and stops once their rock reaches the tee line on the delivery end of the sheet. If your time runs out in an end, you lose your remaining rocks for that end. Team Brendan Bottcher, who were eliminated Saturday morning after a tiebreaker loss to Team Kevin Koe, was burned by the rule on two separate occasions this week. Bottcher says in the standard 38-minute format you could rush with the front-end stones and have more time to discuss strategy on the back end. “I think it rushes the wrong part of the game,” said the 26-year-old skipper. Team Rachel Homan third Emma Miskew played under a similar timing format at the inaugural Curling World Cup in China earlier this year and has a little different perspective on the idea. Other curlers have spoken up on social media after Team John Epping second Brent Laing posed the question on Twitter. “Really dislike! Takes away what's fun with curling. No communication, no fineness. Could maybe work for skins games when no need to evaluate risk/reward, but not for regular curling where communication is key,” said Sweden’s Team Anna Hasselborg on Twitter. Håvard Vad Petersson, lead for Thomas Ulsrud, was on the other side of the aisle. "Athletes always conservative. Curling needs to speed up. I wanna see shot clock on 10 first shots. Then a total time slot for last 6," Vad Petersson said. Athletes always conservative. Curling needs to speed up. I wanna see shot clock on 10 first shots. Then a total time slot for last 6. So, what do the fans think? Legendary curling fan Hans Madsen, who is known for attending just about every event on the curling calendar all while sporting an excellent dyed beard, seems open to the idea. The format is also being tested at the second leg of the Curling World Cup this week in Omaha and will be used again in January at the Continental Cup in Las Vegas. It will be reviewed next month to see how they might implement it going forward. However, the standard 38-minute format will be used at this year’s national and world championships. “Once we get all of the data, we’ll have a discussion at the commissions meeting in January and decide from there,” said Lamoureux.